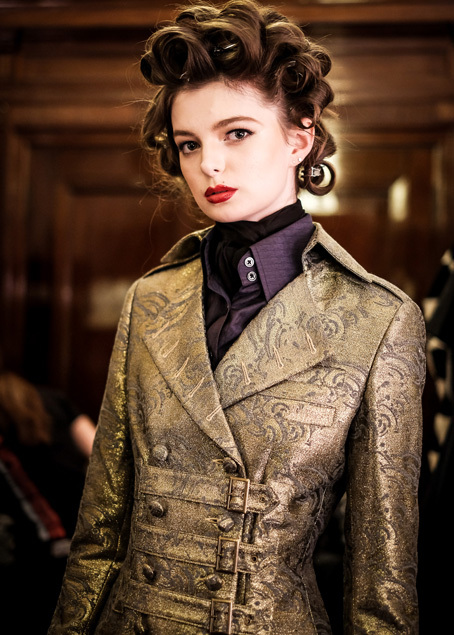 JIRI KALFAR’s AW18 collection entitled ‘The Return Of a Queen’ was a brilliant homage to the Victorian era, featuring ruffles, high-necked collars, wide skirts, and capes. Materials were a mélange of light and heavy, flowing and structured, with beautiful laces and imitation brocades being used. The colour palette emanated opulence, with rich burgundies, royal blue, shining gold, and jet black taking centre stage. Throughout the collection, we saw Jiri Kilfar’s reimagining of 19th century upper class attire for the modern 21st century femme; for instance, lace was placed artfully and sensually, both revealing and concealing parts of a woman’s body- a stark contrast to the modesty of the epoch. Rather befitting the title ‘The Return Of a Queen’, supermodel Paulina Porizkova made her return to the catwalk, closing the show in a spectacularly ornate gown. In line with the brand’s ethos of sustainable fashion with zero waste, this season’s clothing continued to make use of recycled fabrics and local manufacturing. Definitive proof that ethical fashion can be stylish and elegant, guys! 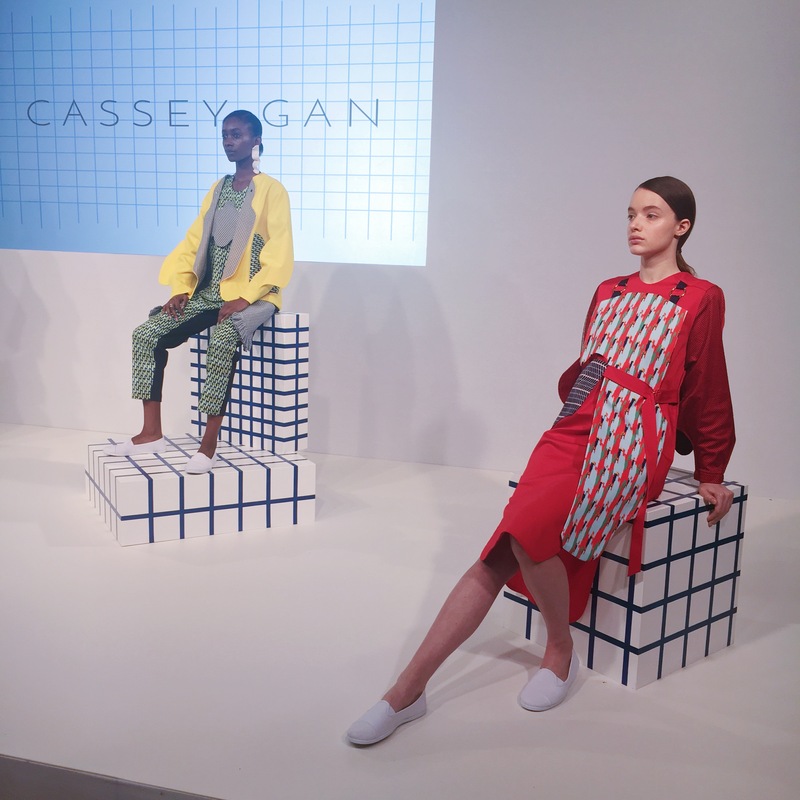 Cassey Gan’s AW18 collection was inspired by the photo series ‘Swimming Pool’ by Maria Svarbova, in which eerily expressionless people are juxtaposed against the stark white tiles and still blue waters of a functionalist Slovak swim centre. 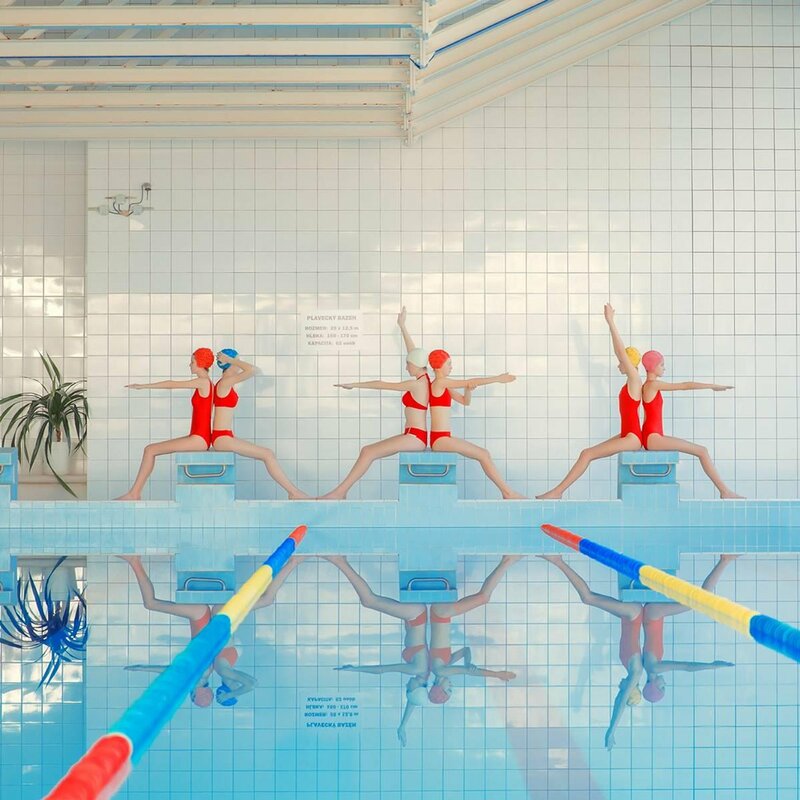 The photos almost look like paintings and through the stark contrast of cheerfully bright colours with the sombreness and stillness of Svarbova’s subjects, a surrealist take on the world appears and we begin to question what is and isn’t real. 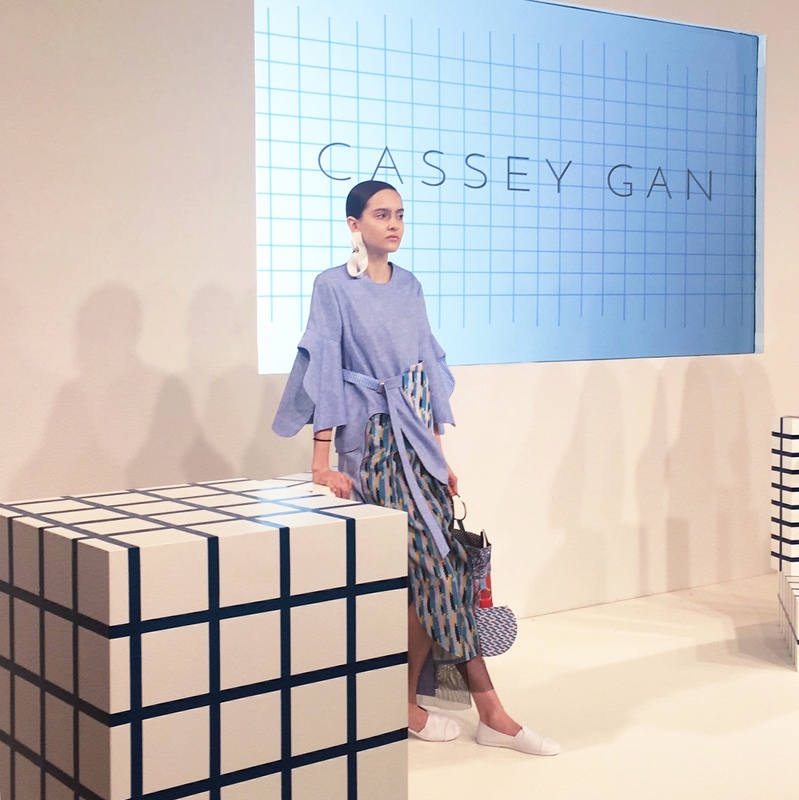 Taking this idea in mind, Cassey Gan therefore wanted to explore fiction and reality in the age of social media, focusing on the faux image of ourselves we tend to create online and the way our pursuit of perfection often makes us forget who we truly are. If we move away from the inspiration and tackle the clothing itself, that too reflects the photographs faithfully. Water ripples resonate through curved lines in prints and the colour palette centres around cool tones, with shades of blue and grey forming much of the collection’s base. Accent colours of yellow and red also hark back to the swimming caps from Svarbova’s photos. A particularly intriguing feature of the collection is the use of layering. Rather than simply placing separate pieces on top of each other, there are instead detachable panels on clothing, allowing looks to fluctuate between elaborate and minimalistic at the whim of the wearer. As they remove each layer, they are revealing what lies beneath; in much the same way, as we remove each edited part of our online presence, we reveal who we truly are. 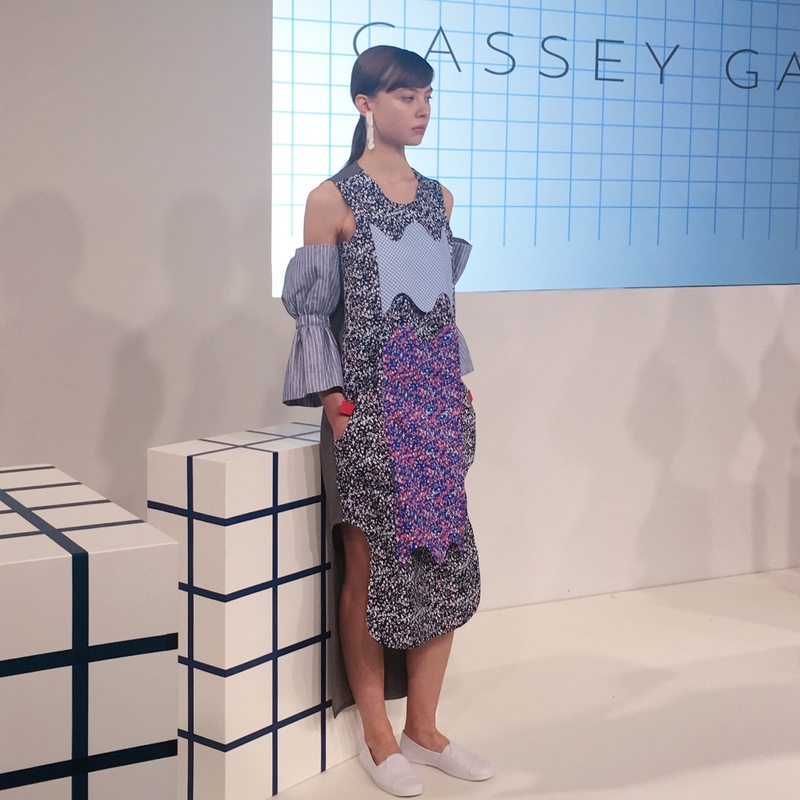 Cassey Gan’s collection is therefore a wearable reminder of our need to be true to ourselves, regardless of whether we’re on – or offline. 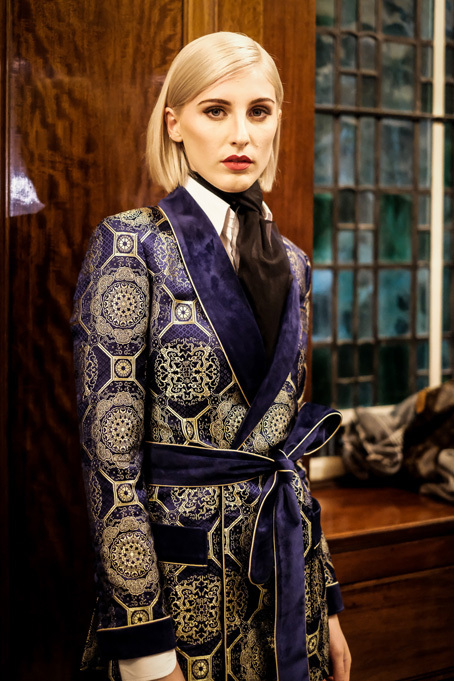 For AW18, Malan Breton delivered a collection that was at once thoughtful and theatrical. Wanting to focus on the end of a journey of self-realisation, he chose to entitle his collection ‘Omega’ and took inspiration from Edwardian Tarot, Merlin, Chinese astrology, and The Four Horsemen of the Apocalypse. 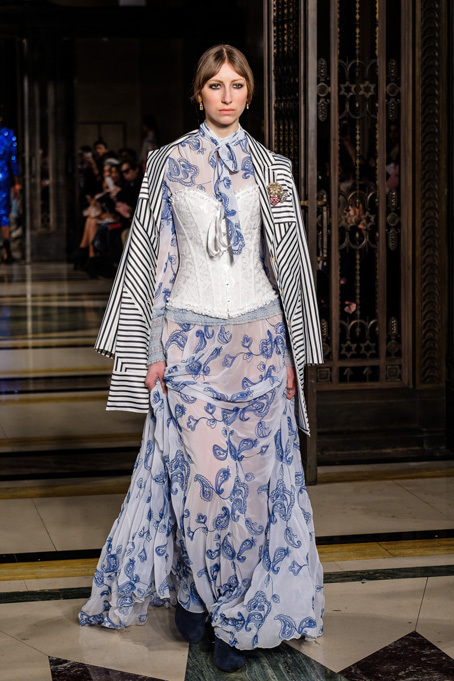 Seemingly looking towards a brighter future even in a time of darkness, Malan Breton created a collection for an optimistic, yet realistic woman. She’s strong and seductive, a fighter and a lover. Rich colours and liberal Swarovski adornments allow us a glimpse of opulence; added to that, silk organzas, silk tulles, and silk brocades give a Romantic flair. To toughen up his vision, shearling and leather have also been incorporated. A standout material was his treatment of recycled bottles as he turned them into paillettes- they were almost indistinguishable from the crystals he used!! This season, Malan Breton wants his woman to rebuild herself and regain hope, which is an attitude we should all take. We need to learn to find the beauty in the world and the beauty in ourselves even if it feels like we’re in dire times of human decline.